QUESTION: AS A LANDLORD, WHY DO I HAVE TO FILE A LEGAL ACTION TO EVICT A TENANT? California has adopted a very specific statutory procedure, to replace the common law self help remedy for evicting a tenant, which often led to violence between landlords and tenants. This statutory procedure can be found in Code of Civil Procedure §§1159-1179a. A landlord’s failure to follow this statutory procedure can result in serious monetary damages and possible criminal prosecutions. Procedures and proceedings in Unlawful Detainer were unknown at common law and are entirely creatures of statute. As such, Unlawful Detainer procedures and proceedings are governed exclusively by their statutory source—CCP § 1159 et seq. (commonly known as the “Unlawful Detainer Act”). And to the extent these statutes address matters of practice, they supersede rules of practice and procedure applicable to civil actions generally. Not even a valid harassment restraining order, directing the tenant to stay away from the landlord and/or landlord’s residence, can deprive the tenant of his or her possessory rights in and to the rented premises. A restraining order cannot itself effect a lawful eviction. Moreover, even where a restraining order might be confused with a judgment effecting eviction, there must be a valid writ of possession and five days’ notice to allow the tenant to voluntarily vacate the property. If the tenant can no longer personally stay on the property under the terms of a valid restraining order, he or she still retains possessory rights under the rental agreement until lawful eviction (e.g., the legal right peacefully to leave his or her personal property within the rented premises). Thus, California Law, prohibits the landlord from forcible entering onto the rental property to evict a tenant without a lawful judgment and writ of possession. In effect, no person out of possession (landlords included) may resort to “self-help” remedies; it is immaterial that the landlord has legal title. Indeed, absent the tenant’s express permission or an applicable provision in the rental agreement specifying the circumstances under which a landlord may enter the premises (other than to recover possession landlords) may lawfully enter their tenants’ units only for statutorily specified reasons, in the time and manner prescribed by the Code (CC § 1954). One such procedure is using a Notice to Enter a Rental Unit for the purpose of inspecting the rental unit for needed repairs or to make emergency repairs in certain citations. 24 hour written notice must be given before entering. The following acts amount to unlawful forcible entry and may violate the prohibition against the use of self-help to eviction a tenant. However, there is no forcible entry/detainer where defendants recover possession under the authority of a writ erroneously issued by the court but obtained “in accordance with orderly judicial processes” i.e., following statutory procedures without act of deception. 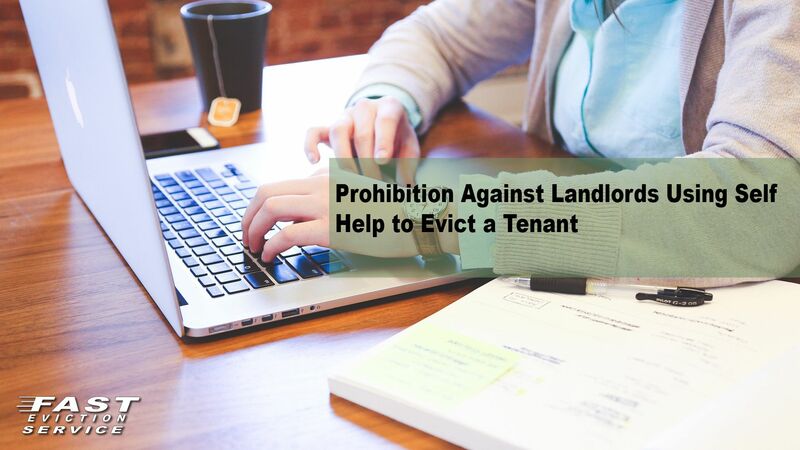 There are numerous other situations where a landlord can violate the prohibition against the use of self-help to force a tenant out of the property. Landlords must be very careful not to do anything that can be interpreted with forcing a tenant out of the rental unit without the use of a proper notice of termination of tenancy and a properly prepared Unlawful Detainer lawsuit that was resolved in favor of the landlord.